Do Good Have Fun™ ( www.dogoodhavefun.com ) is a distributor of one of Amazon’s longest selling and the company’s best-selling compact universal cell phone car mount. The car mount rotates 360 degrees, swivels 180 degrees and accommodates nearly every popular cell phone on the market. Today, Do Good Have Fun™ is pleased to announce the kickoff of their compact cell phone car mount discount sale that includes a free ultra-slim, self-adhesive credit card wallet for smartphones with every purchase. “To kick-off our latest offering we’re holding a 3 day sale for 20% off on the Do Good Have Fun™ Cell Phone Car Mount. With every purchase of our cell phone car mount we now include as a free gift, a new credit card wallet for smartphones,” said DGHF Publicist, Brooke Lee. “The credit card wallet is made with special strong and resilient spandex style material and accommodates nearly all smartphones, as does our universal car mount holder which makes this new packaged deal of ours a special deal. The case is extremely slim at 2.5 mm and flexible enough to hold up to 8 cards, such as credit and debit cards, drivers license, student ID, cash and more. It’s really perfect for men, women, and even children.” Lee added. 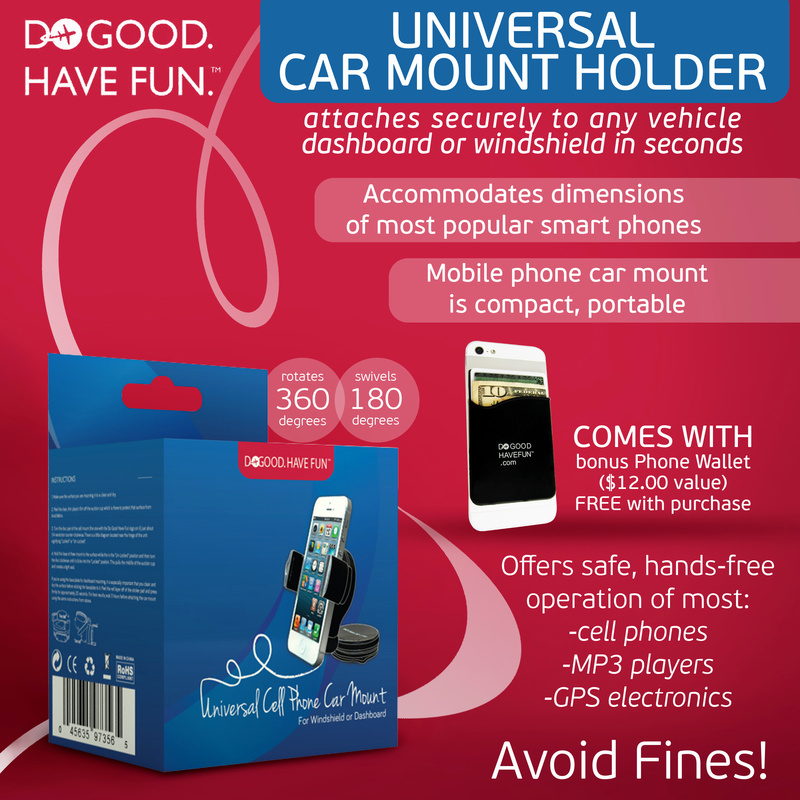 The Do Good Have Fun TM Universal Car Mount Holder is the company’s best-selling car phone mount sold exclusively through Amazon. It’s compact & lightweight design makes it perfect for travel. It fits most mobile smart phones on the market and securely attaches to the dashboard or windshield in under a minute. The discount code for the 20% OFF Do Good Have Fun TM Universal Car Mount Holder w/ included Credit Card Wallet for Smartphones is is 20DOLOVE. The sale begins tomorrow!. Do Good Have Fun™ - Everyday Life Accessories & Travel Related Gadgets that let you “enjoy the ride” in life. Whether it’s for travel or everyday use, Do Good Have Fun™ accessories help make your life easier and more fun. At the heart of our company is the desire to make sure our products have the elements needed to help you do good in the world while also having fun. Do Good Have Fun™ YouTube videos are available here.